« Divergence: Wishful Thinking Or Bottoming Process? Real estate, as an asset, derives its value from two sources: personal income and rents. The first makes it possible for an owner occupied property to be purchased while the second allows for an investor to purchase real estate. US housing market doesn’t seem so bad now, does it? You can check out the OECD report yourself to get the full details. There are many more countries included but I didn’t show them because the charts would have gotten too busy. In any case, they were either too small as an economy or the data was at neither extreme so it wasn’t interesting. Look in the free resource section for the full spreadsheet. You should see how far out of whack the personal income/real estate prices are in Vancouver, Canada. I think it’s the most expensive place to live in the entire country and prices are probably going to get worse with the Olympics coming here in 2010. But sooner or later they’re going to have to come down. Jeff, I can imagine. I have friends there who are waiting on the sidelines. Calgary went through something similar with the oil booms of recent times and back yonder. People never learn really but in the end real estate always comes back to long term parity with these two variables. There is no other way. Garth’s blog? has some interesting data for the market out west. Check it out. In the past I sold my first home without any Net resources. But it was very difficult for me. I heard that some services can publish ads about my home in the Internet. Can you help me to choose between http://www.fizber.com/ and http://www.trulia.com/ ? Do you know anything about these services? My friend said that “Fizber” better than “Trulia”. But maybe he wasn’t right. So I need help. All real-estate is local, so perhaps a weighted average (or total residential real estate vs total personal income) would be more indicative. Canada can be explained by having 90% of its population concentrated in urban areas, thus skewing the median. Given the crisis we are in owes much to abusing the assumption of normal distributions, we should be aware of our eyes being tricked. I am curious as to the distribution of Japanese house prices, and if they are affected by the old massive and now barren housing complexes once built to serve industrial cities. Yura, why not use both? J-C, yes all real estate is local which is even more amazing when you consider the magnitude of the bubble shown in the graphs. Small areas went berserk. The charts are a superficial look at what happened, I’m sure you can find better info drilling down to country specific data. If you find anything interesting, let us know. can someone point me to the OECD study this was drawn from? Thanks. Very curious where Australia would be on this chart. Paul, you can get the data from the link above. Look in the reports and articles folder. 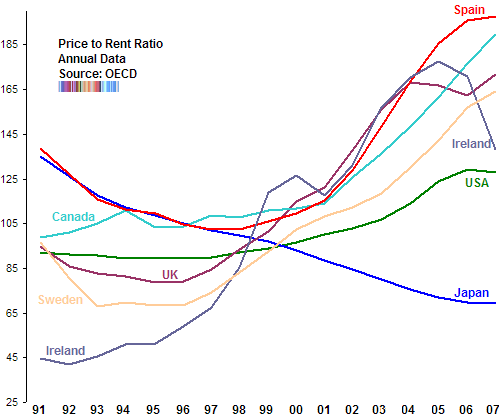 Conor Neu, Australia: price to rent 177 and price to income 145 (2007) - check the file for more data. This argument seem coherent only you believe that the urban/rural composition of Canada changed dramatically since 2000, at a rate even faster than it had in the past. (Remember the ratios are normalized to have an average of 100 across time). And even then, urbanization would only make the cross-country comparisons misleading if it were occurring in Canada at a faster rate than other countries. I’d love to see this graph updated. Joey, yeah, so would I. The source was the OECD so I’ll check to see if they’ve updated it. 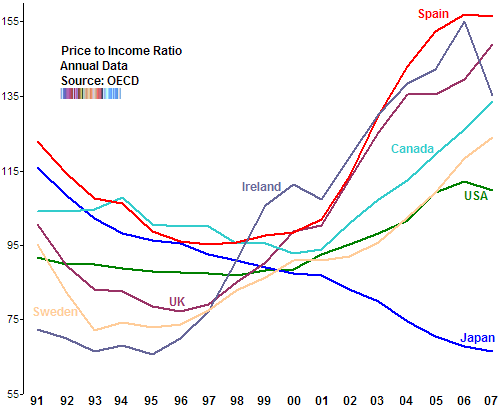 I can tell you that Spain’s real estate took a massive dump. Things are absolutely sickening.